I think mothers should get a whole month of celebration each year, not just one single Mother’s Day. Marriott Del Mar near San Diego’s northern coast agrees. Throughout the month of May, they are giving four lucky moms a free one-night stay plus a $50 gift certificate to their award-winning restaurant, Arterra. Those hand-crafted drawings and poems may melt a maternal heart, but what mom wouldn’t want a free hotel stay for Mother’s Day? The Marriott Del Mar is located between La Jolla (known for its upscale art galleries, village-feel and the seals lazing on its shores) and Carlsbad (of LEGOLAND fame). The hotel is just minutes from the beach, boutique shopping, and fabulous restaurants plus it’s less than a half hour from most of San Diego’s plentiful attractions, like the San Diego Zoo, Balboa Park, SeaWorld San Diego and more. Del Mar is also home to the Del Mar Racetrack with horse racing in the summers and special events like the Holiday of Lights during the winter. The hotel is decorated with a clean, modern look and boasts a fabulous outdoor pool with a hot tub and plenty of cushy lounge chairs. The hotel’s restaurant, Arterra, focuses on field to fork fresh, organic food served in an elegant, yet casual setting. Arterra’s bar area—with made-to-order sushi, happy hour specials, and seating that spills onto an outside patio—draws a happening crowd on Thursday and Friday nights. I got a chance to experience Marriott Del Mar and Arterra firsthand this past weekend. Check out my full review. 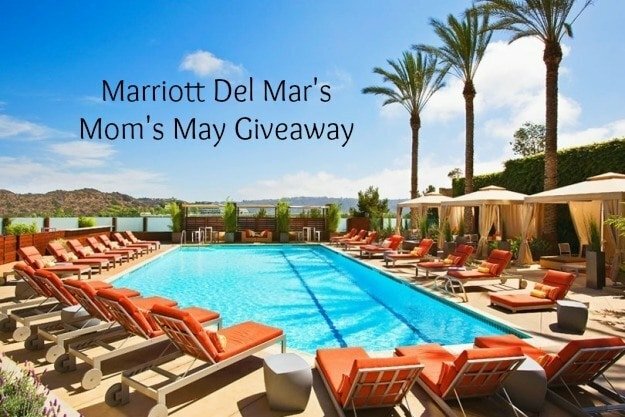 Enter now for a chance to win a one of four overnight stays at the Marriott Del Mar plus a $50 gift certificate at Arterra! A Note from The Travel Mama: My husband and I were hosted by the San Diego Marriott Del Mar for our weekend getaway and we received a gift certificate that covered part of the cost of our meal at Arterra. We have spent plenty of money at Arterra over the years, though, believe me! I didn’t receive any compensation related to this giveaway. Photo credit: San Diego Marriott Del Mar. Just entered. Love this place. Wish me luck. You took some amazing pics by the way! Hope I win!! TY for all you do! I just entered! I have my fingers crossed! Thank you for hosting such an exciting giveaway! Thanks for entering, Cynthia! My fingers are crossed for you too!